The Friedel–Crafts reactions are a set of reactions developed by Charles Friedel and James Crafts in 1877 to attach substituents to an aromatic ring. Friedel–Crafts reactions are of two main types: alkylation reactions and acylation reactions. Both proceed by electrophilic aromatic substitution. Friedel–Crafts alkylation involves the alkylation of an aromatic ring with an alkyl halide using a strong Lewis acid, such as aluminium chloride, ferric chloride, or other MXn reagent, as catalyst. The general mechanism for tertiary alkyl halides is shown below. For primary (and possibly secondary) alkyl halides, a carbocation-like complex with the Lewis acid, [R(+)---(X---MXn)(–)] is more likely to be involved, rather than a free carbocation. This reaction suffers from the disadvantage that the product is more nucleophilic than the reactant because alkyl groups are activators for the Friedel–Crafts reaction. Consequently, overalkylation can occur. Steric hindrance can be exploited to limit the number of alkylations, as in the t-butylation of 1,4-dimethoxybenzene. Furthermore, the reaction is only very useful in an intramolecular sense, and for tertiary alkylating agents, some secondary alkylating agents (generally ones for which carbocation rearrangement is immaterial), or ones that yield stabilized carbocations (e.g., benzylic ones). In the case of primary alkyl halides, the carbocation-like complex (R(+)---X---Al(-)Cl3) will undergo a carbocation rearrangement reaction. Friedel–Crafts alkylation has been hypothesized to be reversible. In a reversed Friedel–Crafts reaction or Friedel–Crafts dealkylation, alkyl groups are removed in the presence of protons or other Lewis acid. Friedel–Crafts acylation involves the acylation of aromatic rings. Typical acylating agents are acyl chlorides. Typical Lewis acid catalysts are acids and aluminium trichloride. However, because the product ketone forms a rather stable complex with Lewis acids such as AlCl3, a stoichiometric amount or more of the "catalyst" must generally be employed, unlike the case of the Friedel–Crafts alkylation, in which the catalyst is constantly regenerated. Friedel–Crafts acylation is also possible with acid anhydrides. Reaction conditions are similar to the Friedel–Crafts alkylation. This reaction has several advantages over the alkylation reaction. Due to the electron-withdrawing effect of the carbonyl group, the ketone product is always less reactive than the original molecule, so multiple acylations do not occur. Also, there are no carbocation rearrangements, as the acylium ion is stabilized by a resonance structure in which the positive charge is on the oxygen. The viability of the Friedel–Crafts acylation depends on the stability of the acyl chloride reagent. Formyl chloride, for example, is too unstable to be isolated. Thus, synthesis of benzaldehyde through the Friedel–Crafts pathway requires that formyl chloride be synthesized in situ. This is accomplished by the Gattermann-Koch reaction, accomplished by treating benzene with carbon monoxide and hydrogen chloride under high pressure, catalyzed by a mixture of aluminium chloride and cuprous chloride. The reaction proceeds through generation of an acylium center. The reaction is completed by deprotonation of the arenium ion by AlCl4−, regenerating the AlCl3 catalyst. Nevertheless, in contrast to the alkylation reaction, the formed ketone is a moderate nucleophile, which forms a complex with aluminum trichloride. The formation of this complex is typically irreversible under reaction conditions. Thus, a stochiometric quantity of AlCl3 is needed. The complex is destroyed upon aqueous workup to give the desired ketone. For example, the classical synthesis of deoxybenzoin calls for 1.1 equivalents of AlCl3 with respect to the limiting reagent, phenylacetyl chloride. If desired, the resulting ketone can be subsequently reduced to the corresponding alkane substituent by either Wolff–Kishner reduction or Clemmensen reduction. The net result is the same as the Friedel–Crafts alkylation except that rearrangement is not possible. As usual, the aldehyde group is more reactive electrophile than the phenone. The Gattermann–Koch reaction can be used to synthesize benzaldehyde from benzene. The Gatterman reaction describes arene reactions with hydrocyanic acid. The Houben–Hoesch reaction describes arene reactions with nitriles. In the Scholl reaction two arenes couple directly (sometimes called Friedel–Crafts arylation). In the Zincke–Suhl reaction p-cresol is alkylated to a cyclohexadienone with tetrachloromethane. The Darzens–Nenitzescu synthesis of ketones (1910, 1936) involves the acylation of cyclohexene with acetyl chloride to methylcyclohexenylketone. The Nencki reaction (1881) is the ring acetylation of phenols with acids in the presence of zinc chloride. The Haworth reaction is a classic method for the synthesis of 1-tetralone. 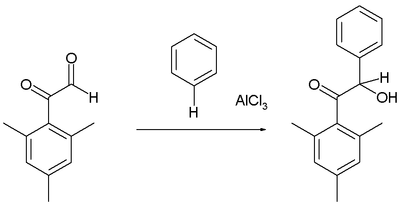 In this reaction, benzene is reacted with succinic anhydride, the intermediate product is reduced and a second FC acylation takes place with addition of acid. In a related reaction, phenanthrene is synthesized from naphthalene and succinic anhydride in a series of steps which begin with FC acylation. Reaction of chloroform with aromatic compounds using an aluminium chloride catalyst gives triarylmethanes, which are often brightly colored, as is the case in triarylmethane dyes. This is a bench test for aromatic compounds. ^ Friedel, C.; Crafts, J. M. (1877) "Sur une nouvelle méthode générale de synthèse d’hydrocarbures, d’acétones, etc.," Compt. Rend., 84: 1392 & 1450. ^ Price, C. C. (1946). "The Alkylation of Aromatic Compounds by the Friedel-Crafts Method". Org. React. 3: 1. doi:10.1002/0471264180.or003.01. ISBN 0471264180. ^ Groves, J. K. (1972). "The Friedel–Crafts acylation of alkenes". Chem. Soc. Rev. 1: 73. doi:10.1039/cs9720100073. ^ Eyley, S. C. (1991). "The Aliphatic Friedel–Crafts Reaction". Compr. Org. Synth. 2: 707–731. doi:10.1016/B978-0-08-052349-1.00045-7. ISBN 978-0-08-052349-1. ^ Heaney, H. (1991). "The Bimolecular Aromatic Friedel–Crafts Reaction". Compr. Org. Synth. 2: 733–752. doi:10.1016/B978-0-08-052349-1.00046-9. ISBN 978-0-08-052349-1. ^ Rueping, M.; Nachtsheim, B. J. (2010). "A review of new developments in the Friedel–Crafts alkylation – From green chemistry to asymmetric catalysis". Beilstein J. Org. Chem. 6 (6). doi:10.3762/bjoc.6.6. ^ L., Williamson, Kenneth. Macroscale and microscale organic experiments. Masters, Katherine M. (Seventh ed.). Boston, MA, USA. ISBN 9781305577190. OCLC 915490547. ^ Smith, W. T. Jr.; Sellas, J. T. (1963). "Neophyl chloride". Organic Syntheses. ^ Hajra, S.; Maji, B.; Bar, S. (2007). "Samarium Triflate-Catalyzed Halogen-Promoted Friedel–Crafts Alkylation with Alkenes". Org. Lett. 9 (15): 2783–2786. doi:10.1021/ol070813t. ^ Anslyn, E.; Wallace, K. J.; Hanes, R.; Morey, J.; Kilway, K. V.; Siegel, J. (2005). "Preparation of 1,3,5-Tris(aminomethyl)-2,4,6-triethylbenzene from Two Versatile 1,3,5-Tri(halosubstituted) 2,4,6-Triethylbenzene Derivatives". Synthesis. 2005 (12): 2080–2083. doi:10.1055/s-2005-869963. ^ Norman, Richard Oswald Chandler; Coxon, James Morriss (1993). Principles of organic synthesis (3rd ed.). London: Blackie Academic & Professional. ISBN 0751401269. OCLC 27813843. ^ Somerville, L. F.; Allen, C. F. H. (1933). "β-Benzoylpropionic acid". Organic Syntheses. 13: 12. doi:10.15227/orgsyn.013.0012. ^ "Desoxybenzoin". www.orgsyn.org. Retrieved 2019-01-26. ^ Friedel-Crafts Acylation. Organic-chemistry.org. Retrieved on 2014-01-11. ^ Fuson, R. C.; Weinstock, H. H.; Ullyot, G. E. (1935). "A New Synthesis of Benzoins. 2′,4′,6′-Trimethylbenzoin". J. Am. Chem. Soc. 57 (10): 1803–1804. doi:10.1021/ja01313a015. ^ Clemmensen, E. (1913). "Reduktion von Ketonen und Aldehyden zu den entsprechenden Kohlenwasserstoffen unter Anwendung von amalgamiertem Zink und Salzsäure". Chemische Berichte. 46: 1837–1843. doi:10.1002/cber.19130460292. ^ Clemmensen, E. (1914). "Über eine allgemeine Methode zur Reduktion der Carbonylgruppe in Aldehyden und Ketonen zur Methylengruppe". Chemische Berichte. 47: 51–63. doi:10.1002/cber.19140470108. ^ Clemmensen, E. (1914). "Über eine allgemeine Methode zur Reduktion der Carbonylgruppe in Aldehyden und Ketonen zur Methylengruppe. (III. Mitteilung.)". Chemische Berichte. 47: 681–687. doi:10.1002/cber.191404701107. ^ Gattermann, L.; Koch, J. A. (1897). "Eine Synthese aromatischer Aldehyde". Ber. 30: 1622–1624. doi:10.1002/cber.18970300288. ^ L. Gattermann; W. Berchelmann (1898). "Synthese aromatischer Oxyaldehyde". Berichte der deutschen chemischen Gesellschaft. 31 (2): 1765–1769. doi:10.1002/cber.18980310281. ^ Hoesch, Kurt (1915). "Eine neue Synthese aromatischer Ketone. I. Darstellung einiger Phenol-ketone". Berichte der deutschen chemischen Gesellschaft. 48 (1): 1122–1133. doi:10.1002/cber.191504801156. ^ Grzybowski, M.; Skonieczny, K.; Butenschön, H.; Gryko, D. T. (2013). "Comparison of Oxidative Aromatic Coupling and the Scholl Reaction". Angew. Chem. Int. Ed. 52: 9900–9930. doi:10.1002/anie.201210238. ^ Zincke, Th. ; Suhl. R. (1906). "Ueber die Einwirkung von Tetrachlorkohlenstoff und Aluminiumchlorid auf p-Kresol und p-Kresolderivate". Chemische Berichte. 39 (4): 4148–4153. doi:10.1002/cber.190603904115. ^ G. Grassi and C. Maselli (1898) "Su alcuni derivati clorurati de trossimetilene" (On some chlorinated derivatives of 1,3,5-trioxane), Gazzetta Chimica Italiana, 28 (part 2) : 477-500 ; see especially p. 495. ^ This reaction with phosphorus pentoxide: Kamp, J. V. D.; Mosettig, E. (1936). "Trans- and Cis-As-Octahydrophenanthrene". Journal of the American Chemical Society. 58 (6): 1062–1063. doi:10.1021/ja01297a514. ^ Nencki, M.; Sieber, N. (1881). "Ueber die Verbindungen der ein- und zweibasischen Fettsäuren mit Phenolen". J. Prakt. Chem. (in German). 23: 147–156. doi:10.1002/prac.18810230111. ^ Sereda, Grigoriy A.; Rajpara, Vikul B. (2007). "A Green Alternative to Aluminum Chloride Alkylation of Xylene". J. Chem. Educ. 2007 (84): 692. Bibcode:2007JChEd..84..692S. doi:10.1021/ed084p692. ^ McCullagh, James V.; Daggett, Kelly A. (2007). "Synthesis of Triarylmethane and Xanthene Dyes Using Electrophilic Aromatic Substitution Reactions". J. Chem. Educ. 84: 1799. doi:10.1021/ed084p1799. ^ Haworth, Robert Downs (1932). "Syntheses of alkylphenanthrenes. Part I. 1-, 2-, 3-, and 4-Methylphenanthrenes". J. Chem. Soc. : 1125. doi:10.1039/JR9320001125. ^ Li, Jie Jack (2003) Name Reactions: A Collection of Detailed Reaction Mechanisms, Springer, ISBN 3-540-40203-9, p. 175. Diphenylacetone, Organic Syntheses, Coll. Vol. 3, p. 343 (1955); Vol. 29, p. 38 (1949) Article link. Dibenzoylethylene Organic Syntheses, Coll. Vol. 3, p. 248 (1955); Vol. 20, p. 29 (1940) Article link.